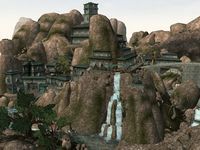 Akamora is the largest Indoril settlement in the Mephalan Vales region, and close to the border between Indoril and Telvanni territory. However, the surrounding high cliffs and narrow mountain paths make the city naturally defensible, and so the nobles have more to worry about from their in-house rivals. Novas Senim, noble and house brother of the Great House Indoril, is technically the Lord of Akamora. His rule is very weak and is hampered by the powerful Indaren and Parys families that also reside in the city. Seras Indaren is one of the more powerful nobles of Akamora and the most aggressive in his opposition against Novas Senim and the most vocal about his desires to rule the town in his stead. The easiest way to reach Akamora is by Silt Strider, with routes from Sailen, Necrom, and Tel Muthada available. The link to Tel Muthada and the Telvanni lands beyond makes Akamora an important stop for those wishing to travel to the northern reaches of Morrowind. The town also is host to a Dunmer Temple, and so is reachable by Almsivi Intervention spells. Members of the Mainland Mages Guild can utilize a Guild Guide to travel to the local Mages Guild. This is connected to the Southeastern Guild Guide hub which includes the Old Ebonheart guild guide. The mountain paths for reaching the city on foot are treacherous, and the Mephalan Vales region is rife with dangerous creatures and bandits. Outlanders in Akamora will state the city is referred to as Dragon Glade on Imperial maps. Dragon Glade was a town in The Elder Scrolls: Arena. An Underground Bazaar filled with several traders can be found near the Silt Strider port. A Mages Guild guildhall, a Morag Tong guildhall, and a Fighters Guild guildhall can all be found deeper in the city. A Tribunal Temple can be found within the city. Hunting Daedra: Deal with some marauding daedra that have been plaguing Akamora. Character Flaw: Find out what is making a local man act crazy. The Nobura Tayo: Help track down a valuable gem. The Nameless Dunmer: Help a Dunmer find out who his ancestors are. Belated Service: Take out a bandit gang in the cave of Seranassid and find out what has become of a missing guild member tasked with the quest before you. Beleaguered Sanctuary: Kill Tedril Draren. Conflict of Interest: Find a pair of runaway slaves and make a choice between helping them escape slavery or return them to their master. A Lifted Ledger: Find Clibergus' ledger and bring it to him. 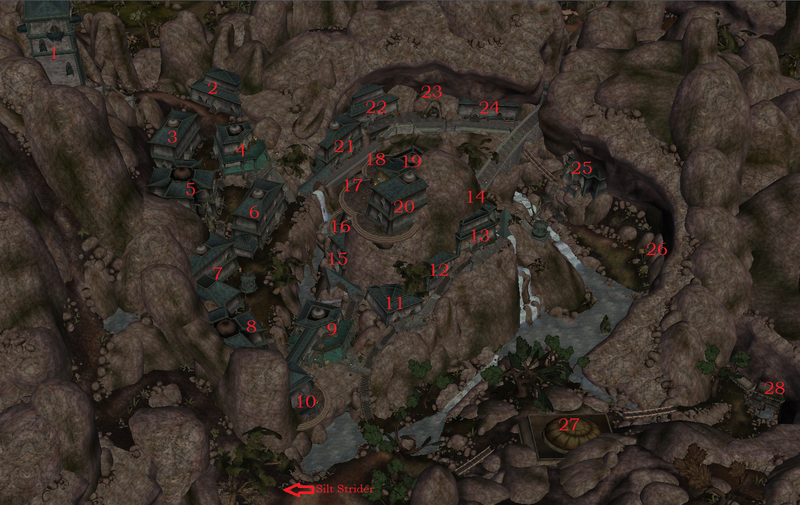 Instructions from an Altmer: Find Galdalior at the top of Tomaril Manor. No Sin Goes Unpunished: Track down a repentant assassin in the Holy City of Necrom. Noble Protection: What should be a simple bodyguard job goes bloody awry. Akavorioc: Kill the legendary vampire Akavorioc, a devoutee of Molag Bal. Caught in a Web: Find a girl gone missing. Find out what forces are working against the Guild in Akamora. Letter of Resignation: Deliver Francine's letter of resignation to her old Telvanni master. Field Research: Try to ask for the permission to conduct research in Necrom's bonewalker smithies. Investigation at Fort Windmoth: Find out the reason behind an arrest warrant. Striking Roots: Bring 20 horn lily bulbs and 20 timsa-come-by flowers to Polodie. Harvest time in Akamora: Deliver paralysis resistance potions to the guard tower. A Rare Enchantment: Obtain an amulet from the local temple. Interview with a Vampire: Ask questions on vampirism to an isolated pack. This page was last modified on 17 March 2019, at 01:48.